This guide will demonstrate how to setup the Energia IDE, how to manage libraries, how to install boards, and how to build your project. The Energia IDE is a cross-platform application (for Windows, macOS, Linux) which provides a simple one-click mechanisms to compile and upload codes to the IoT boards it supports. Energia is an open-source electronic prototyping platform which provides the Wiring and Arduino Framework to the Texas Instruments boards (MSP430, MSP432, TM4C, C2000, and CC3200 LaunchPad). Similar the popular Arduino IDE, the Energia IDE is a code editor with multiples features, including text cutting and pasting, searching and replacing text, automatic indenting, syntax highlighting and much more. It also provides a message area which will let you debug all the processes of firmware during construction. For a detailed explanation of all the features that the Energia IDE brings check out the official documentation here. Energia projects. 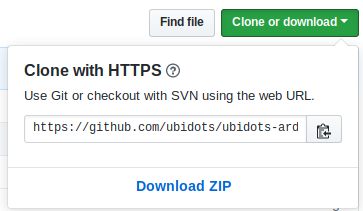 For example, the Ubidots Library contains multiple methods to SEND and GET data (values, contexts, and timestamps) to/from the Ubidots platform without being an advance programmer. 1. Below is a list with Ubidots Libraries supported and available in the Energia IDE library catalogs, at this time. IMPORTANT NOTE: Ubidots libraries available in the Energia IDE do not warrant the full functionality of a multi-thousand device IoT solutions. If your solution will utilize 50+ devices, Ubidots recommends that you compile your own library utilizing one of theses IoT optimized communication protocols: HTTP, TCP/UDP, or MQTT. MERCHANTABILITY, FITNESS FOR A PARTICULAR PURPOSE AND NONINFRINGEMENT. IN NO EVENT SHALL THE AUTHORS OR COPYRIGHT HOLDERS BE LIABLE FOR ANY CLAIM, DAMAGES OR OTHER LIABILITY, WHETHER IN AN ACTION OF CONTRACT, TORT OR OTHERWISE, ARISING FROM, OUT OF OR IN CONNECTION WITH THE SOFTWARE OR THE USE OR OTHER DEALINGS IN THE SOFTWARE. 2.1. Go to the Github repository of the desired library (list provided above) and download the library. To download the library click the green button called "Clone or download" and select "Download ZIP". 2.4. Close and reboot the Energia IDE to continue working. The Energia IDE also supports third-party hardware platforms. Follow the steps below to include a piece of hardware or platform in your IDE. 1. 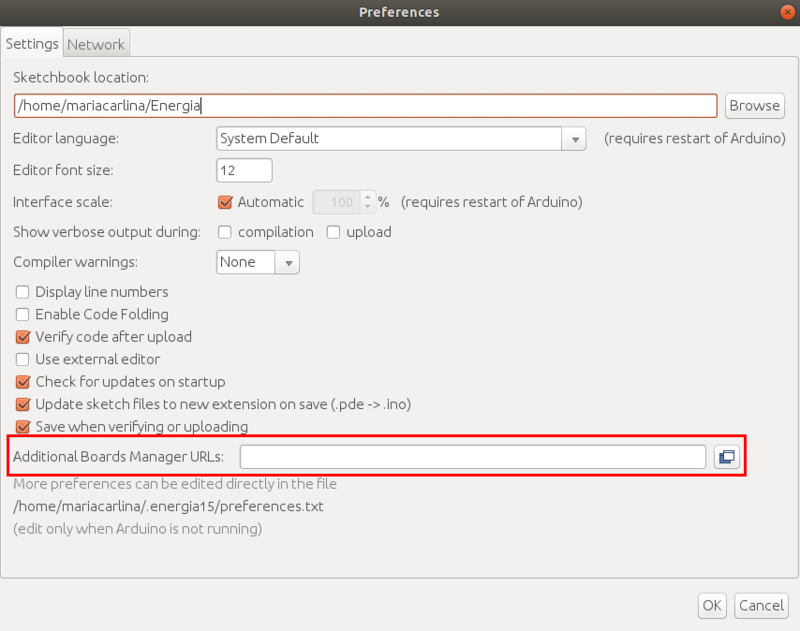 Open the Energia IDE, select Files > Preferences and enter the URL of the hardware platform desired into Additional Board Manager URLs field. NOTE: You can add multiple URLs by separating them with commas. 2. 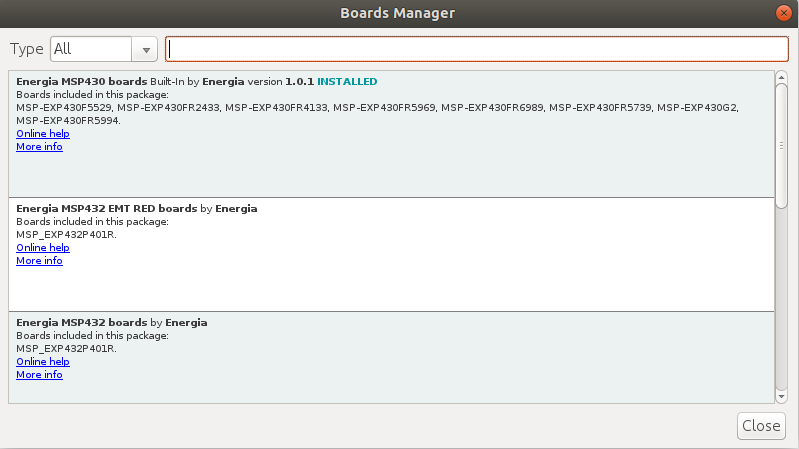 Now, based on the hardware platform included, go to Boards Manager from Tools > Board > Boards Manager and install the platform previously included. To simply find the correct device, search the brand of the respective device within the search bar. 3. Confirm if the hardware platform previously installed now exists in your list of available boards. Go to Tools > Board and note that the brand of the hardware you uploaded now appears. Select the board to continue working. As we mentioned above, the Energia IDE provides a simple one-click mechanisms to compile and upload codes to any boards supported by the Energia IDE. Once the code is verified, you will receive a "Done compiling" message in the Energia IDE. Once the code is uploaded, you will receive a "Done uploding" message in the Energia IDE.